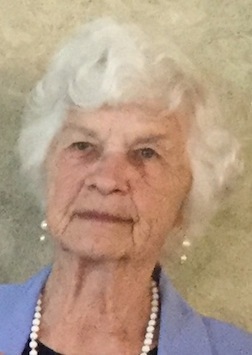 Anna V. House, 91, of 134 W. Arch Street, St. Marys, PA formerly of Emporium, PA passed away at Pinecrest Manor, St. Marys, PA on Thursday morning (March 14, 2019). She was born July 1, 1927 in Montmorenci, PA, a daughter of the late Fred and Margaret Fitch Launer Jr. On February 27, 1947 in Johnsonburg, PA she married the late Percy House. Anna joined Sylvania in Emporium during the WWII war years where she worked nearly 20 years prior to her retirement. There she worked with her husband Percy, with whom she shared long and happy marriage. Together they raised seven children with most of those years spent in Rich Valley. Later moving to Emporium for a short period, they then settled in Bellefonte for about 25 years where she had the enjoyment of watching grandchildren participate in sports activities and ultimately had the privilege of attending their weddings. Later in life, she returned to Saint Mary’s where she greeted a generation of great-grandchildren who brought her great joy. Anna never wavered in her love and devotion to family and friends. She serves as a wonderful example of life well lived. She credited her Swiss heritage for her independent spirit and will be greatly missed by all. Anna is survived by son, Gary (Donna) House, Victor, NY; daughter, Nancy Farber, Howard PA; son, Bradley (Suzanne) House, Lutz, FL; daughter, Diane (Pete) Quinn, Boalsburg PA; son, Brian House, St. Marys; seventeen grandchildren, sixteen great grandchildren; brother, Thomas Launer, Harmony, PA; brother, Carl Launer, Zelienople, PA; sister, Joan Robuck, Wilcox, PA; brother, Gerald Launer, Ocala, FL. In addition to her parents and husband she was preceded in death by two sons, John and Kelly House; and sister Catherine McCamey and two brothers, Ronald Launer and Frederick Launer. Visitation will be at the Barnett Funeral Home, 207 E. Fourth Street, Emporium, PA on Tuesday (March19, 2019) from 1-3 PM followed by a Funeral Service at 3:00 PM with Rev. Bruce Burkness, Pastor of St John's Lutheran Church, officiating Burial will be in the Rich Valley Cemetery, Emporium, PA.